Eternal recently previewed a new keyword from the impending 5th set: Pledge. On your first turn, a card with Pledge can be played as a Sigil. Great, it's a smoothing mechanic and high-variance games like CCGs need smoothing mechanics. • You draw a good mix of power and non-power. Play Recruit as a 3/3 for three; not amazing but far from embarrassing. • You draw more power than you'd like. Play Recruit as a 3/3 for three. • You draw fewer power than you'd like. Play Recruit as a Justice Sigil; that's great. For Limited, Recruit is an autoplay, so it's nice that it's common. I can only speculate how relevant it is to Constructed, but it's certainly worth consideration and that's something. There's actually another relevant case we should look at to help us evaluate Recruit, and pledge. • You draw two or three Recruits, or a handful of various pledge cards. You can only pledge one of them, because you can only pledge on your first turn, and you can only play one power per turn. Is it enough? Does being stuck with all those unpledgable pledge cards hurt your chances? Some of the other pledge cards look quite solid, even at common. 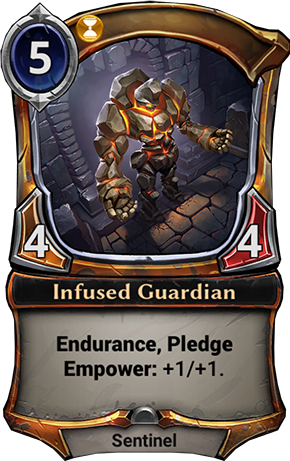 I would play Infused Guardian in every Time deck I draft, without the option to pledge it. 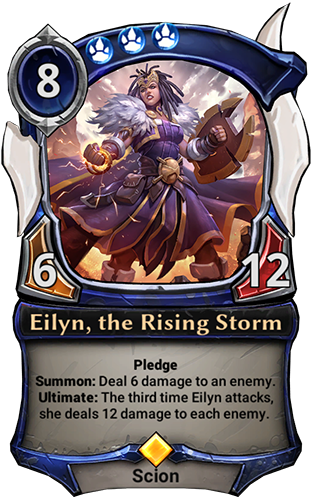 All these previews seem pretty reasonable for their price/rarity, and it seems like pledge was balanced to be as marginal an added cost as possible. That's both assuring in terms of potential lost value, and disappointing in terms of expected value. Or maybe they're just being really generous because they want pledge to be ubiquitous so it can do some real work smoothing out the game. I've looked at similar mechanics several times. In 2016 I designed one that let you free-cycle duplicates, and another that let you free-cycle on your first turn. In 2013, I proposed something very similar to pledge, and Evan Jones something even more similar. Any game that shuffles up 60-75 card decks with a fundamental A•B mechanic like things-to-do / fuel-to-do-them is going to have way too much variance and will need a lot of strong smoothing mechanics to help players play actual games. Not all solutions are perfect, and it's possible to reduce variance too far, but such mistakes are rare and almost never catastrophic. Having not yet played with pledge, I'm optimistic about the result and excited by the effort. It's too soon to say what I'd change about pledge's mechanical implementation or gameplay, but there is a dropped ball I can see already: Pledge is entirely devoid of flavor. 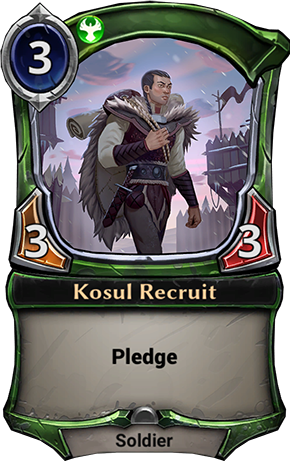 Neither does pledge tell us anything about the character of the card it's on, nor is there anything mechanically tying the pledge cards together. Where it appears seems fairly arbitrary: it's in all five factions, on units costing 3-8 at least, and no further pattern to their identity, even by name. What do an Intimidator, a Guardian, a Borderscout, a Recruit, and a Storm have in common? There are two elves and two sentinels, but also a scion and a soldier, so nothing there either. If there had just been one thing tying all the pledge cards together, the keyword would have an identity players could really latch onto. For limited, I think Pledge is great, but I commented when it was revealed that I think it's almost impossible to even try to create a Pledge card for constructed that actually ever gets Pledged. Pledge itself isn't a big enough benefit to get you to play cards you wouldn't play without it, because in constructed you should build your power-base to be more reliable. On the other hand, the better a Pledge card is on its own, the less you actually want to pledge it, unless absolutely necessary. So, unless they manage to hit a pretty small target in the middle, I think most cards that get played with Pledge will be powerful enough that you won't actually play them as power unless you're desperate. You're right that it will feel a bit sad to lose a card you want to play, but I think that will affect LSPs more, because the HSPs will be ecstatic to trade that one card for the ability to play their other cards. In a way, that moment is a lot like accessing the market—you've got to give up something to get something, and sometimes you're sad to give up anything, but it's almost always worth it. I don't know, pledge on high cost cards seems great for ramp decks. Hitting early sigil drops is essential, but you're playing so many additional Sigil effects that you want to up your late game threat density. Yeah, pledge on high cost cards sounds amazing to me. I think it will be especially effective in eternal because the mulligan rule promotes having such greedy mana bases. They will help up the percentage of opening hands with 3+ power, like seek power does, while only running 25 power. Anyway, at 25 power, you have a 43% chance of drawing 3+ power, and a 32% of exactly 2. If you're running 6 pledge cards, that 32% x 34% chance of the remaining 5 having at least one pledge card is an additional 10% chance of a 3 power opening hand, the same odds as a 28 power deck. Pledge has been pretty great. The two-color pledge cards are the most powerful, since they let you choose either sigil to play. I always pledge a card if I've only got two power cards, usually if I've got three, and sometimes if I've got four (if I also have some expensive cards). I would never play a pledge card just because it has pledge (not in Constructed), but it's a notable upside for cards that might not quite make the cut otherwise.